Have you heard of Trunk or Treat? It’s a fun idea for community groups like sports teams, churches, even schools. Basically, everyone in the community decorates their trunk for Halloween, they all meet in a parking lot and the kids trick-or-treat from trunk to trunk. It’s such a clever idea! This year is the first year that I’ve heard of it and I love the idea. 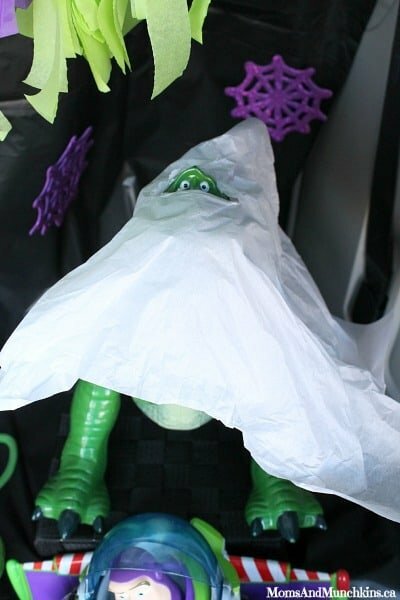 I’ve teamed up with Nikki of Tikkido and a fabulous group of bloggers to share their ideas for decorating your own Trunk or Treat. For my Trunk or Treat display, I decided to use a lot of the items we already have at home. 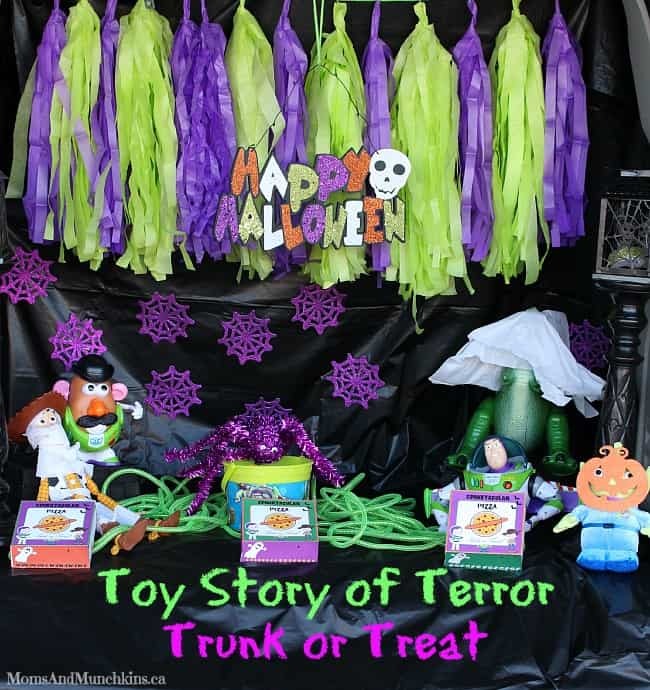 We love the short movie Toy Story of Terror so we went with this fun theme for our display. I started with a black plastic tablecloth pinned to the roof of the trunk to hang as a backdrop and base. 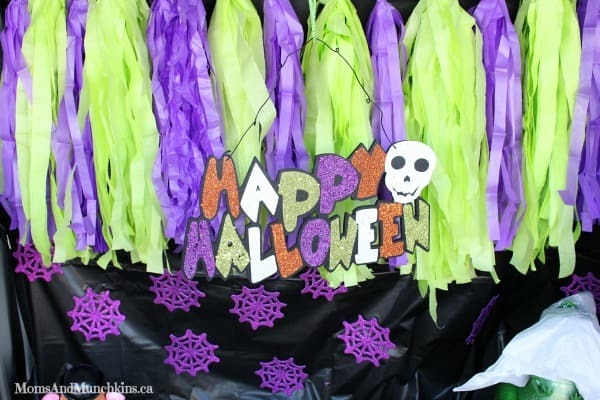 I made tissue paper tassels for a banner in purple and green and then added a “Happy Halloween” sign from the local dollar store. I have a couple of tall black candlesticks that I used to hold Halloween-themed lanterns (also from the dollar store) on either side of the display. 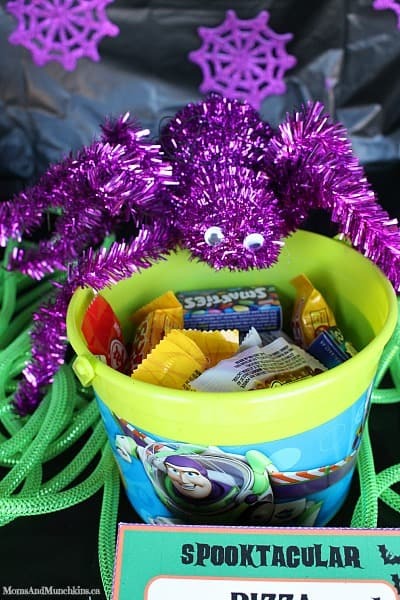 I added glittering purple spiderwebs (also from the dollar store) to the black backdrop and put our purple spider as a little guard for the candy. 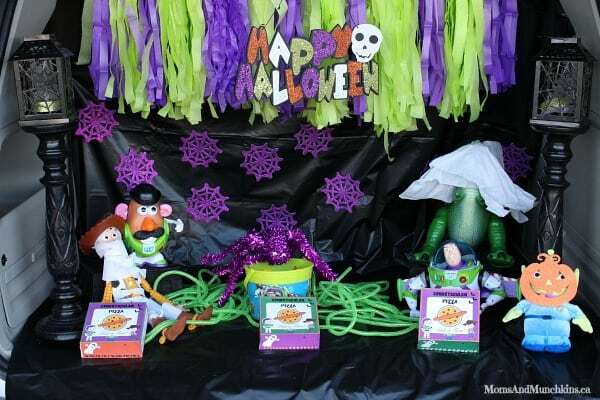 It was then time to add in all of the spooktacular Toy Story characters. Rex dressed up as a ghost. Mr. 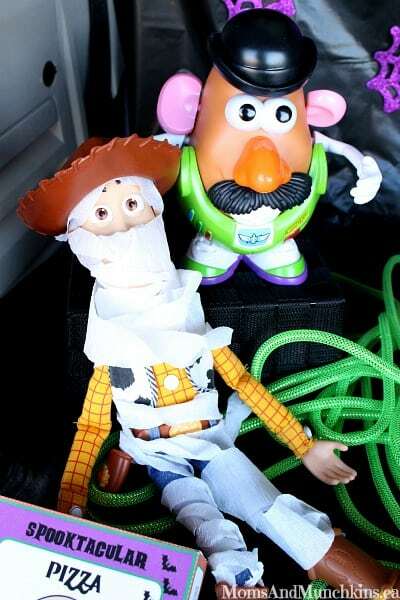 Potato Head dressed up as Buzz Lightyear while Woody dressed up as a mummy cowboy. 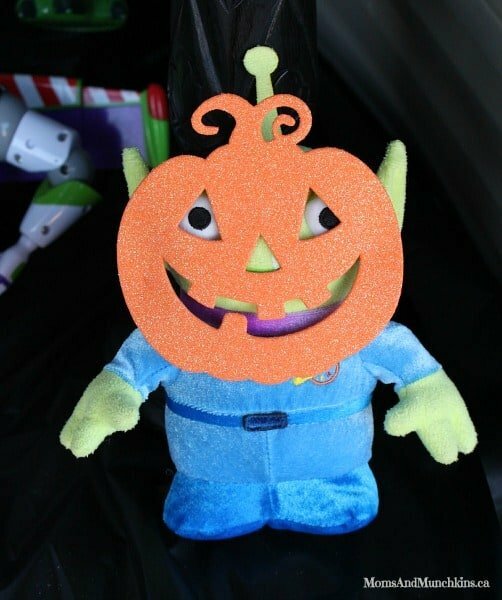 One of the aliens went as a cute jack-o-lantern. 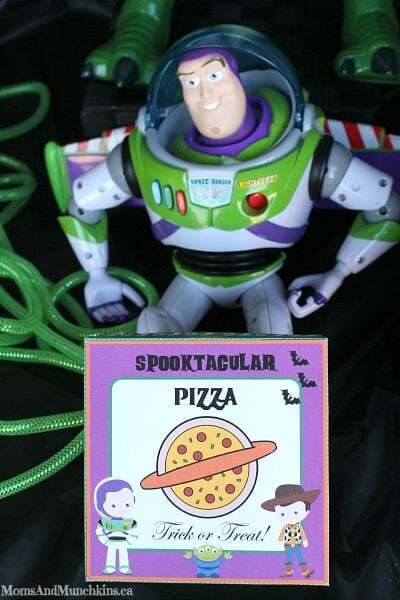 Buzz simply went as a special space ranger sent to guard the candy. 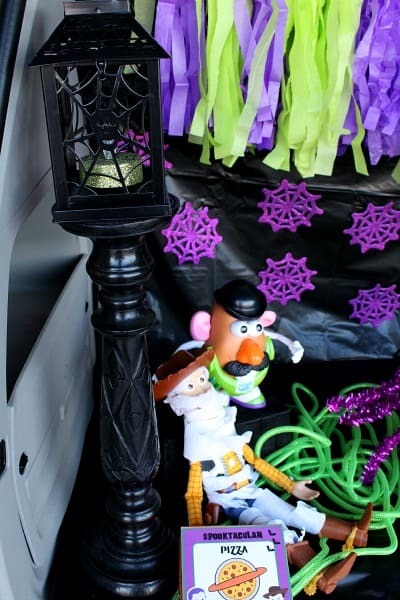 So there you have it – our fun Toy Story of Terror Trunk or Treat display! 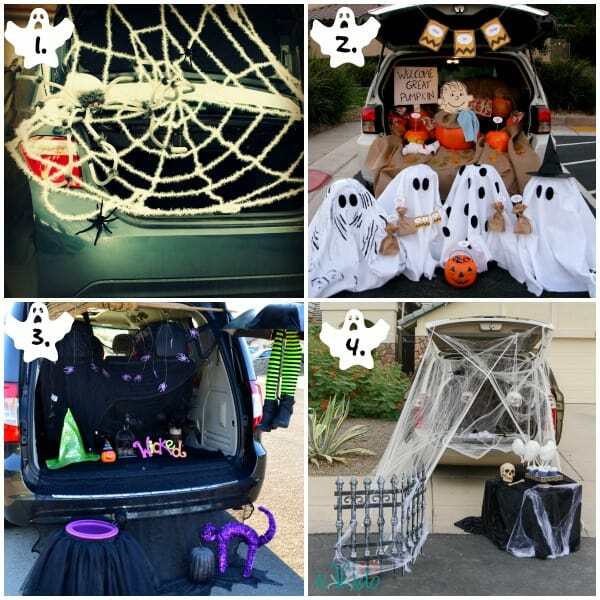 Tikkido has gathered a creative group of bloggers with their own ideas for Trunk or Treat. 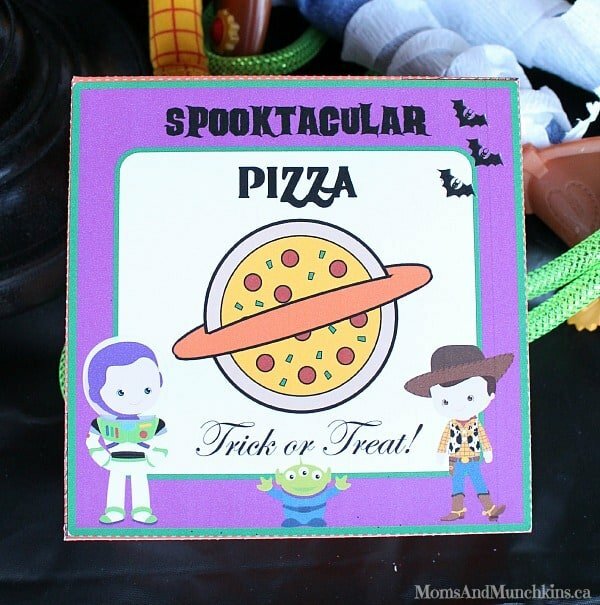 Check our these spooktacular ideas! 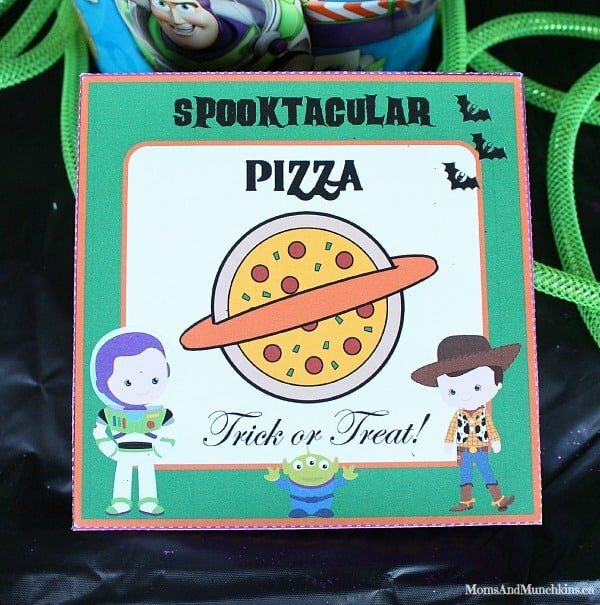 For even more fun ideas for Halloween, visit our special Halloween Fun page! This is too cute! 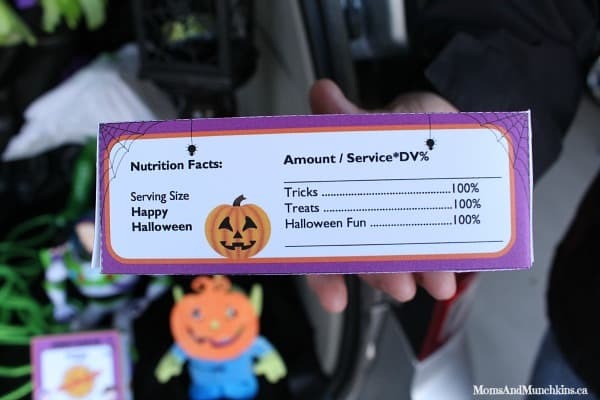 Trunk or treat is such a fun option for kids!